After my recent debacle of an elk hunt, I gladly turned my attention away from big game and onto big trout. I’m not much of a hunter – though not for lack of trying – but I’d like to think I’m an average angler. Fall is the best time of year to hunt for big trout, especially browns. It’s no coincidence that my best brown trout have all come to the net during fall, including the one I have mounted above the desk in my home office. I think there’s a propensity in fly fishing to present mount-worthy trout as these ultra-rare creatures only caught by the extremely experienced or luckiest of anglers. That predisposition makes catching your own trophy brown seem all the more intimidating, but it’s really not that tough. It’s more a question of time and effort than it is technical difficulty. With that said, however, there are a few things you can do out on the water this fall to help increase the odds of landing a trophy brown trout. About a month ago, my buddy Ryan and I were floating the Green River. It was one of those balmy fall days that feels warmer than it really is, especially with the sporadic blue-winged olive hatches that littered the river. Instead of casting to every fishy piece of water, Ryan had me working only the spots most likely to hold big fish. We didn’t bring any to the boat that day, though I spooked a few and lost one that was well over the 20-inch mark. The attitude of hunting instead of fishing is necessary if you’re serious about getting into trophy browns. Yes, you have to put in plenty of casts, but the most effective way to do it is by fishing the places big fish are probably hiding. It’s like late-season elk hunting; you don’t hike to the top of a ridge, sit in snow-covered aspens, and try to call in big bulls. Instead, you stay low where the herds like to winter and pick out your target from that vantage point. It’s the same concept for trophy browns. Find the places you know will have big fish, and then fish them relentlessly. Streamers are the most popular fly to use when targeting big brown trout; they’re even more effective in the fall. Browns will strike at anything and everything that gets near their territory during spawning season. Big browns are especially prone to swallowing streamers whole, or tagging them hard enough to give you a chance at a solid hook set. Usually, streamer fishing is a subtler art than anglers realize; slow, irregular strips and twitches are more effective than the robotic wrist-to-waist retrieve. That’s not the case during fall, when you want your streamer action as aggressive as the fish you’re targeting. And while we’re on the subject – don’t overlook the value of mouse flies, either. If you’re fishing low water, anything with a big profile that looks edible will elicit strikes from bigger trout. You need to know two things about finding big browns – where the redds are and where the deep holes are. A brown trout redd on Utah’s Lower Provo River. Photo by Spencer Durrant. You want to find the redds so that you can a) avoid stepping in them, thereby ruining your brown trout fishery’s future, and b) to find the fish stacked behind the redd that are eagerly eating drifting roe. It’s generally viewed as unethical to fish directly to trout that are actively spawning on their redds, and from a conservation standpoint, I agree. But casting to fish well behind the redds (like those pictured below) is a great way to find big fish. Brown trout swimming on redds in Utah’s Lower Provo River. Photo by Spencer Durrant. Ideally, you’ll want to fish behind redds that are built on the lip of a big hole. The deeper, slower water is a haven for big trout, and gives them plenty of easy opportunities for food. Big brown trout get big for a reason – they’re wily buggers and you’ll have to be on top of your game to put a trophy in the net. But fall gives you the best chance to do just that, and hopefully these tips can eliminate some of that steep learning curve. 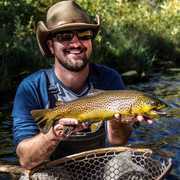 Spencer Durrant is a fly fishing writer, outdoors columnist, and novelist from Utah. His work has appeared in Field & Stream, Sporting Classics Daily, American Angler, Trout Magazine, Hatch Magazine, and other national publications. Spencer is the Owner/CEO of Cutthroat Creative Media. Find him on Twitter/Instagram, @Spencer_Durrant. The Pyramid Lake Mistake When you travel for a fly fishing trip, you expect to catch fish.